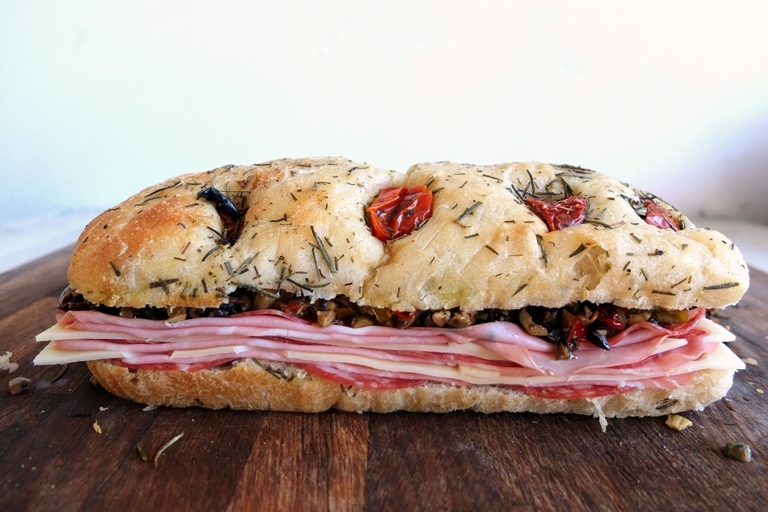 Helen Graves' muffaletta recipe makes a sandwich of epic proportions, with layers of salami and cheese topped off with a chopped salad of antipasti favourites including artichokes, roasted peppers and olives. A welcome tang comes from capers and pickled chillies, while crusty focaccia provides the perfect vessel to the fiendishly decadent fillings. 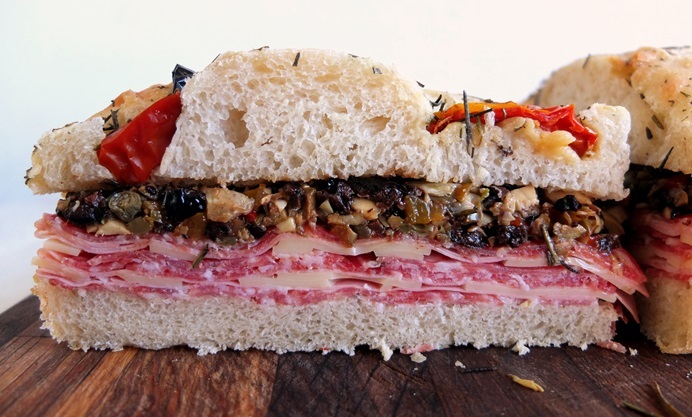 The muffaletta is one of the sandwich world’s greatest hits. Originating in New Orleans, it’s said that its invention can be attributed to a grocer who noticed the local Sicilian workforce balancing their lunch of meat, cheese, pickles and bread on their knees. He suggested they combine everything into a sandwich and the muffaletta was born – or so the story goes. This isn’t a traditional muffaletta for two reasons. The first is that the muffaletta is actually the name of a special loaf, which is a type of Sicilian round bread, sprinkled with sesame seeds. It’s similar in texture to focaccia, apparently, but with a crisper crust, hence my substituting focaccia in this recipe. The other major difference is that I’ve not used the traditional Italian garden pickles (giardiniera), because, let’s face it, they’re not that easy to find in the UK, and most people won’t want to make their own for the sake of a sandwich. So, this is a little variation, which, hopefully, you’ll still find delicious, if inauthentic. I suppose you could use any variation of cured meats and cheeses really, but you do want to keep that Italian deli flavour, so I recommend keeping the salami and mortadella if possible. The resulting sandwich is… yeah it’s large. 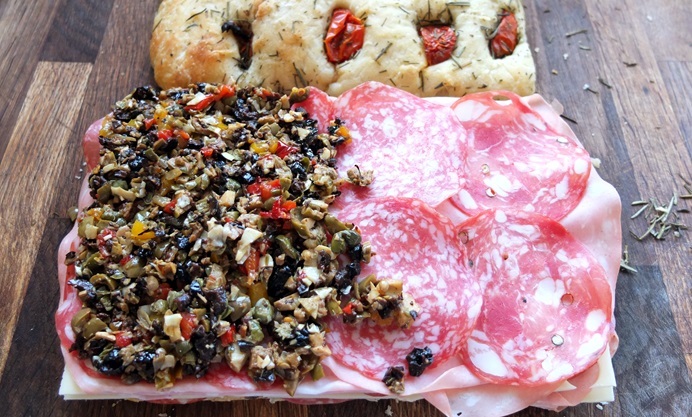 The layers of meat and cheese stack up but the richness is balanced by the chopped olives, capers, chillies and artichokes, with a little sweetness from peppers. It’s very satisfying, and will serve around 6 people. Oof.